Many Elgin OGS Members have indicated their research interests and their ahnentafels and pedigrees can be fo und on our Ancestors Indexes page and on the free FamilySearch.org website. Some members have shared their contact information and invite you to email them to share family information. Adair, Bob and Marilyn – Researching ADAIR, CANTELO, CULVER, FLOWERS, PETTIT in St. Thomas, Southwold Township, Elgin County, Lincoln County and Middlesex County. Beaman, Gerald – Researching BEAMAN and BUTLER surnames in Elgin, Norfolk and Oxford Counties. Bradley, Connie – Researching in Elgin Co., surnames, GRASS, HUMPHREY, FULKERSON, CARNES, SANGER, MANNING, BLAKELY and TRIBE. Burton, Mark – Researching surnames of STRASSER, WILSON, OXFORD, MATTIS, HAWS, NUTELL and MCINNES families in Sparta, St. Thomas, Yarmouth Twp., Elgin County. Oxford, STRASSER in Middlesex County. Cameron, Nancy – Researching John (1784-1875) and Henrietta McTavish (1785-1872) KERR buried at Old Pioneer Cem. in New Glasgow. Also searching EASTLAKE, BLUE, NICHOL related to the MCTAVISH family and DELONG names. Carr, Marty – Researching in Yarmouth Twp. CARR, MULLEN,and in Southwold Twp., BALSDON, ANDERSON and HOWARD. Cooper, David M. – Researching MCGREGOR, CROSBY, STEVENSON, FORREST, WILSON, TAYLOR, STEINHOFF, WELTER, NORMAN, GROVES, DINGMAN and WONNACOTT surnames in Elgin and Norfolk Counties. Dieter, Alayne – Researching the FULTON , ELLMAN , and SWAFFIELD families in Elgin County. They were primarily located in Southwold and Yarmouth Twp. Other names include the Zurbrigg’s, Good’s, and Farncombe’s of Perth County, and the Dieter’s and Cathrae’s of Bruce and Gray County. Di Lello, Donna – Researching in St. Thomas and Aylmer areas, HARRIS, STROYBERG, ELGIE, ESSELTINE, ROSS, HAWKINS. Elliott, Elizabeth – Researching McLAWS, McCRAPENK, CAMERON, FORBES, McKILLOP, STEVENSON in Dunwich Township and Elgin County. Also The Wallacetown Carriage Company. Fletcher, Carolyn – Researching HANNAN (HANNON), PARTRIDGE, STOCKTON, BOWLBY, JACOB SMITH, TUTTLE, ADDY, RACHEL SWAYZE and some BOUGHNER lines. The Tuttle family originated from New York State, and most of the rest were from New Jersey. Especially looking for information on HANNAN family who immigrated from Ireland to either New York or New Jersey, then to Upper Canada and received Crown Land from Col. Talbot early 1800s. Foreman-Bobier, Angela – Researching in Elgin County my family surnames DAVY, WILTON, WELLS,CHURCHILL, HARVEY, FLOWERS, HIRONS, HATHAWAY, TUFFIN, SMITH, MARSHMAN, CARMICHAEL, MARSH, PERRIN, LESLIE, ALLAN. Also researching my husband’s family surnames BOBIER, OSTRANDER, BINKS, MIZON, LUNN, CLUNAS, MCLAWS, BARNES, SKINNER, MCINTYRE, KERR, MCTAVISH , BROWER, MACKENZIE, MILLS, GILBERT, MCLACHLEN. Researching for Tyrconnell Heritage Society surnames: BACKUS, HAMILTON, STOREY, PATTERSON, PEARCE, specifically the family of Mary Jane Hamilton married to Andrew Backus, owners of what is now theBackus-Page House Museum. Gibson-Frazier, Cheron – Researching surnames GIBSON, LUMLEY, BROWN, and WATSON families in Dunwich and Southwold Townships, Elgin County. Harrison, Ross (deceased 2010) – Surnames in Ontario, LUNDY, PAGE, CHAPMAN, FOSS, FELL, FRALICK and SHOTWELL. Ahnentafel for Ross Harrison. Hindmarsh, Carol – Surnames in St. Thomas and Elgin County being researched are HINDMARSH, COMFORT and HAGAR. Hurdle, Brian – Surnames in Southwold Township: Cole, Koyle. In Elgin and Middlesex Counties: Giles, Hurdle, Haskell. In Kent, Lambton & Middlesex Counties: Fretz, Haskell, June and inter-related surnames. In England: Giles and Yeatman. U.E. 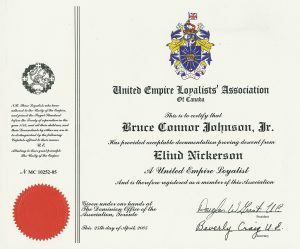 certificate for proving descent from Eliud NICKERSON, U.E.L. of New Brunswick, Cobourg and Grantham Twp. Researching in Port Bruce, Springfield, Dunboyne and Malahide Twp., Levi NICKERSON, U.E., Daniel WHITESELL, U.E., Daniel ALWARD, Walter BROWN, Silas CARTER, Gilbert MILLER, Elizabeth, Anna and Lydia FELKER / VOLCKEL, Matilda, David, Sarah, and Irena GOFF, Rufus YOUNG, Humphrey JOHNSON, JOHNSTON, Henry CONNOR and Margaret WHITCRAFT / WHITCROFT. Link to Bruce’s Ancestry web page at Bruce C Johnson Family History Research Also see the Whitesell Researchers web site. FamilySearch.org pedigree for B. Connor JOHNSON. (free – login required). Jones, Janet – Researching in Elgin County Robert & June WHALEY, FUNSTIN, CADOTTE, PETTIT, GREEN and MOORE. Keen, Barbara – Joseph BONNER and wife Matilda STEPHENS BONNER came to Canada West circa 1844 with sons Joseph and John. Joseph Jr. married Susanna MCSLOY. He and his family migrated to Michigan in 1857. John was a dentist and married Elizabeth GILLUS. Please contact me re any information on this family. Killey, Dave – Researching surnames COVILLE, SHAW, MCDOUGALL and LESLIE in Aldborough Twp. and ATTREE, BENTLEY, DIELEMAN, GARDNER, HELLIWELL, HERDMAN, KILLEY, MARONTATE, MILLS, MUTH, MORRISON and POTTERS. Kindree, Becky – Researching KINDREE in Ontario. Manchen, Ron – Researching in Elgin, Middlesex and Lambton for PLAIN, PLAINE, MANCHEN, MANSION, JENNINGS, BEECROFT, COBBIN, BALSDON, BALSDEN, GIBBS, CLEMENS, McCAFFREY, McCRAE, WATSON, WOODCOCK, FISHER, FRENCH, RILEY, EVELAND, ROSS, MARLATT, SHEPHERD, SCOTT, CLARK, CUMMINGS, ATKINSON and HOLBORN. In Ontario for WOODWARD, LILLEY and RUMBALL. McCallum, James L. – Surnames in South Dorchester and Malahide Twps. and Ontario, MCCALLUM, SIMPSON, HOSNER, WHITCROFT / WHITCRAFT, FAIRBROTHER, CORLESS, NEFF, NEWELL and JOHNSTON. Ahnentafel for James Leon McCallum. Miller, Winifred K. – Surnames in Elgin Co., Southwold Twp., Yarmouth Twp., Dunwich Twp., Malahide Twp. and St. Thomas; CLARK / CLARKE, JONES, DOAN, MORSE and HAMILTON (1825-1870). Mitchell, Derek – Researching in Elgin, Middlesex and Oxford counties for any information on the ancestors or descendants of : Reuben and Matilda COVILL / COVEL of Yarmouth and Oxford (Norwich), John and Mary KINSEY of Port Bruce and Aylmer, David and Sarah MITCHELL of Yarmouth (Sparta) and Malahide, John and Ruth WILLSON / WILSON of Yarmouth (Sparta) and the surname WISSON. Murray, Bill – Researching the families of Peter SMITH and Ann MUNRO in Elgin and Middlesex counties. Related families are : COLE, CURRIE, CAMERON, WYATT, MCNIVEN. Also researching Peter SMITH and Louisa HEMSLEY in Middlesex and Perth Cos. related families are: TIER, FRAME, MURRAY, DURST. Norris, Ron – Researching in Elgin County; MOORE, GODFREY, SANDERS, KINGSBURY, BLACK and McCALLUM. O’Reilly, Anne – Researching the in Elgin County, Malahide Twp: Samuel ALLEN and Richard D STIRTON; in Bayham Twp, Chauncey SMITH (including TUPPER and CHAPIN families). In remainder of Ontario: William MORRIS and Richard VENNING in Middlesex County, James ELLIOTT in Oxford County, James DEPEW of Wentworth County, James STIRTON and Richard ELLIS of Wellington County,\. Plummer, Ernest – Surnames in Bayham Twp., SWAN, HILL, LOWELL, and BACKHOUSE (BACUS). Register report for Henry M. Swan. Prinsenberg, Joselin – Researching FINCH. Grandfather Walter Hamilton FINCH. Looking for parents of Henry FINCH, born 1810 in Charlotteville, died March 25, 1856, buried in Rogers Corners Cemetery, Malahide. Married Maria COOK. Quesnel, Diana – researching the WHITE/VAN BUSKIRK / VANBUSKIRK families of St Thomas. Carter Roche); COOK, Willard; TREMAINE, Wesley C. Surnames in Ontario: BOLTON, CARRUTHERS, CHAPMAN, ROCHE, WOLFE and related families. Ritchie, Barbara – Researching COWLEY, LEACH, LAPHAM and MCGARRICK in Elgin County and England. Ahnentafel for Barbara (Cowley) Ritchie. Rogerson, Dolora – Researching the ROGERSON and NOTT families who came to Elgin County. ROGERSON’s arrived in Elgin around 1900’s from Oxford County. They mainly settled in Middlesex. This would also include the JACKSON, and the VARCO families. Rose, Calvin – Surnames in Simcoe Co., Scotland and England, ROSE, BUSH, MOYES and FELL. Ahnentafel for Calvin Rose. Sharon, Margaret – Researching in Southwold Twp., Elgin Co., ancestors and descendants of brothers Hugh and Thomas SHARON. Family names include PAYNE, CAMPELL and SMITH (including the artist ST. THOMAS SMITH). Smith, Jackie – Surnames in Bayham and Malahide Twps. BLISS, SOPER, FOSTER, MARR, THOMAS, LEWIS, MITCHELL, LEMON and HARRISON. Sobiski, Janine – Researching Campbell in Fingal, Southwold Township. P.O. Box 85, Leith, ON N0H 1V0. Stephens, David – Researching Elgin county, Malahide, Bayham primarily for NOEL (NOELS), and related lines-FREEMAN, SHAW, PURDY, HATCH, NEFF. Searching Oxford County, Dereham and Ingersoll area for BERDAN, FREEMAN. Temple, Pat – Names of interest – TEMPLE, GREENSLADE, WALKER in Bayham – Port Burwell area and KELLEY and MINARD in Yarmouth Twp. and Sparta. Thomas, James (Jim) H. – Researching in Elgin and Middlesex (upper Canada) for THOMAS, WATSON, BENEDICT, BEST, BODINE, BURWELL, CLARK(E), DUNCOMBE, GARNSEY/GUERNSEY, GORDON, LEWIS, LUMLEY, MACDONALD, NELLES, NEWCOMBE, PEACOCK, PHELPS, ROBB, RUSSELL, SHAW, SHIPLEY, SILCOX, SMITH, TOBYNE, VAN VELSOR, WESTBROOK, WILLEY. Thompson, Robert – Researching in Bayham Twp., Malahide Twp., Southwold Twp., surname MCCONNELL and William H BROWN. Also interested in DOOLITTLE, BACKHOUSE, VAN VELZOR, HUNTER, HOUGH, and WESTOVER. Tull, Robert – Researching in Bayham Twp., Alexander and Joseph DEFIELD sometimes given as DUNFIELD. White, Beatrice F. (Ray) – Surnames in St. Thomas, Malahide and London, WHITE, RAY, STRATH, COULTER, HOUGHTON, SWAYZE and LONGWORTH. Please contact the Elgin Webmaster for corrections and additions.